The Farfnians rule the galaxy with an iron claw, and Earth has been relegated to a backwater planet. What's an ingenious human to do? Find a chink in the Farfnian's chitinous armor - cheese! Enter Harry Fische, captain of the stringship Limburger, and his intrepid crew: a xenophilic pilot, a security officer with more brawn than brain, and an immortal engineer with a death wish. 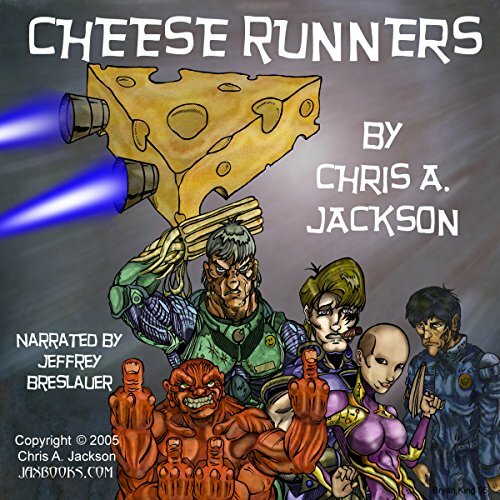 Smuggling cheese is just a job - until they rescue a curvaceous clone who make the best margaritas in the universe. That's when all hell breaks loose. This book is made of laughs. The main character and his crew are certifiably insane. Harry Fische is constantly making asides that makes this book feel like he's actually just telling you a story, like while in a bar or something. His crew are varied and distinct with mental problems of their own, and each interaction is a great source of laughs. The future Jackson has cooked up has laughs at every turn, with lots of overt craziness and subtle jokes. Can't wait to read the next one!